Quite a few people have been asking about vCloud 5.1 feature support in PowerCLI. Guess what: It's here! PowerCLI 5.1 R2 has officially dropped, and the new vCloud 5.1 features are built in! The .extensiondata property is really the same object as you would get from the Get-CIView cmdlet. From this, we see that we now have the ability to automate the creation, removal and revert of snapshots in vCloud Director 5.1! Creating, Reporting on, and Removing snapshots is now easy! Let's check out another one. Edge Gateways are new in vCloud Director 5.1. How do we find those without any new cmdlets? Search-Cloud! Search-Cloud returns a search object, and from this we can get the .NET object with all the properties and methods. Note that we don't have to use the .extensiondata, because we used Get-CIView to directly get the .NET object. Let's check out the .configuration! Both the vCloud Admin and Tenant PowerCLI snap-ins have been updated, so if your cloud provider is running on 5.1, enjoy the new features! Now, this is certainly not all PowerCLI 5.1 R2 has to offer. Powershell 3 support as well as an official VDS snap-in are also available! 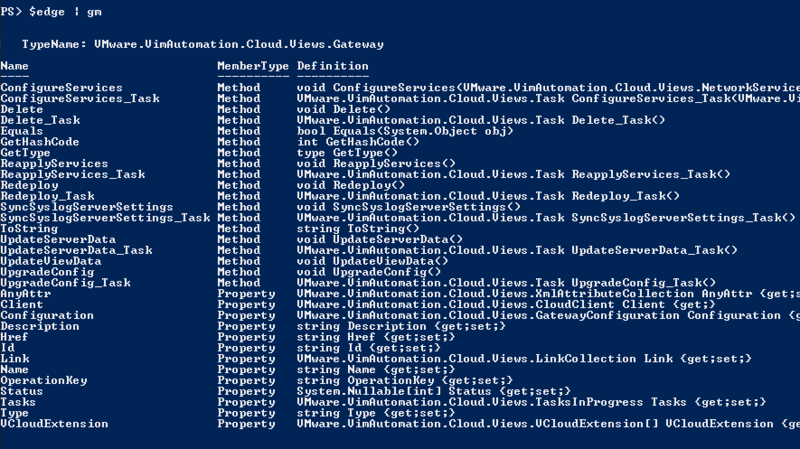 You can read more about these updates on the Official PowerCLI Blog! For tons of VDS examples, See Alan's post!